Outrageously decorated Easter eggs are on display at the Grand Floridian Resort at Walt best viagra buy viagra Decorated Easter Eggs” width=”67″ height=”101″ />Disney World. For the fifth year, viagra sales pills the bakery team was given complete creative freedom to design and hand decorate the eggs. As you can see, viagra the beauty and creativity is outstanding! I sure hope they keep this tradition alive. The Grand Floridian is such a perfect place to celebrate spring and Easter. About the author…F. G. Mama, Katie McDill, has been in love with Walt Disney World since first entering the gates in 1976. After her two kids went off to college, she moved from Georgia to the backdoor of the Magic Kingdom in Florida. She worked several years at Walt Disney World performing as Fairy Godmother in day parades, the “Best of Disney” castle stage show, and the original Electric Light Parade. For the last ten years, she along with daughter and family, have enjoyed “living the dream” in Celebration (the town that Disney built) just across the bridge from Disney World. During this time she has collaborated with son-in-law Jimmy in several production projects including Orlando Attractions Magazine-The Show, The Mindy Mouse Show and FunaticsTV. Her other career included being a writer, artist/designer, special events creator and coordinator. Now she is enjoying the good life of Anna Maria Island, Celebration, Disney World and, of course, sharing magic at FUNaticsTV! 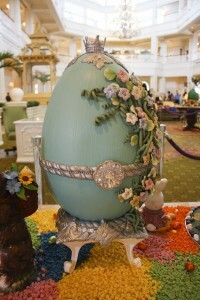 Decorated Easter Eggs, Easter, Grand Floridian Resort. Bookmark.